Under IFSA 2013, it is no longer about Product Innovation. It is about Product Compliance. 2 weeks ago I had a session with some bright individuals discussing the Islamic contracts commonly used in Corporate Banking financing structures. We went through almost all the available Islamic financing contracts such as Murabaha, Ijara, Musyaraka and Mudharaba, where I highlighted that all these contracts now have their own Policy Document issued by Bank Negara Malaysia (BNM). The Policy Documents, in my opinion, are a concise version of a lot of Sharia regulations and great reading source. It becomes a reference point where management roles and responsibilities are outlined, operational behaviour laid down, and theoretical basis is justified and explained. It is a matter of time, I told the participants, that these Policy Documents are taken in their full context and finally developed into a comprehensive structure with clear compliance to Sharia requirements. We, as Islamic Bankers, are in for an exciting period of development where we will have a chance to develop “real” Islamic banking contracts. The moment I said that, I realised it is NOT TRUE!!! The popular belief is that IFSA 2013 is meant to realign all the Islamic Banking regulations in the Islamic Banking Act, Takaful Act and various major guidelines into a single overarching Act. IFSA 2013 consolidates the various practices into more clarity and re-classification of concepts. However, the perception that Islamic Banking in Malaysia as an innovative development hub would no longer hold true. “Innovation” was the key thinking and pride-point prior to IFSA 2013; now I believe the right word is “Compliance”. When we first started the Islamic Banking journey in late 1990’s and early 2000s, BNM encouraged a lot of product innovation from Banks as there were no existing guidelines. We looked at the various structures that provides the desired outcomes and discussed with Shariah Committee on the design and component of products without breaching Sharia rules. BNM was supportive on us developing these “innovative” products. Some may have been controversial (such as Bai Inah, Bay Ad Dayn, Wadiah and Bai Bithaman Ajil) but it encourages discussions alongside the mantra that “whatever is not explicitly prohibited, is permissible“. Sometimes we were forced to think outside of the box, especially for sophisticated products mirroring conventional. We also received support from Sharia Committees whom temporarily approved “innovative” products with the understanding that over time, a better solution were developed as replacements. Now with the issuance of the Policy Documents, such innovation becomes limited. Innovation is now ring-fenced around compliance to Shariah rules (either from regulators or internal Shariah Committee), and the Banks are expected to follow these rules to the letter. Breaches to these rules becomes the responsibility of the Bank’s Shariah Committee and detailed deliberation is greatly expected to provide the solution. Compliance first; if it is not covered in the documents, it probably cannot be done without a lot of effort. With compliance now being the vogue vocabulary with BNM, Banks had to look hard to the Policy Documents to ensure the requirements are identified and gaps filled for fear of breaches or fines. The gap analysis falls into the line whether “are we complying to the requirements?” and not “how do we do this without it becoming a gap or compliance issue?”. Both Shariah and Bank’s Product teams would now look on how to comply with Policy Documents instead of using the Policy Documents as a reference to develop a product. What I noticed since 2014 is the obsession to comply with Islamic contract requirements, and if the team feels it is difficult to comply, the next logical step is to avoid such contract altogether and seek an alternative contract which is easier to comply with. For example, the Murabaha Policy Document issued in 2014. I have to say it is a beautiful document, and outlines the requirements for Murabaha Purchase Orderer (MPO) that reflects the full Sharia requirements of ownership transfers, risk taking, profit and management of actual assets. These requirements, which in the eyes of many Banks, may be difficult to fully comply with due to many reasons: shortage of expertise, systems infrastructures limitation, people understanding, complicated processes, operational risks, credit issues and fund management requirements. Instead of the risk of breaching the Policy Documents, Banks opt for something less “complicated” which offers “similar” structure. The default solution is Tawarruq Arrangement i.e. Commodity Murabaha. Or, the teams looks at Ijara Policy Document. It outlines further the roles and responsibilities of lessor and lessee, while the asset remained in the Bank’s ownership throughout the lease tenure. Again, if a roadblock occurs where a Bank cannot fully comply… Tawarruq Arrangement provides a quick solution. With very defined rules outlined in Tawarruq Policy Documents, the Banks are confident that offering Tawarruq will not breach any guidelines. Tawarruq, therefore becomes the default Islamic contract in the market. When I asked the participants during case-studies to the question “What contracts should be used for this structure?”, the answers are unanimous “Tawarruq”. And they are not wrong. Making Tawarruq as the “all-problems-solved” structure is having an unfortunate result to the industry. While the issuance of the Policy Documents as a reference was to galvanise the development of various Islamic contracts, the Banks have an easy way out in Tawarruq. Now, the rest of the contracts are in danger of being sidelined in favour of continuous development in Tawarruq. For example, the Home Financing product which had evolved from BBA in the 1980s to Diminishing Musharaka in the 2000s. When BBA was introduced, practitioners and Sharia teams identified several practical issues that over a period of time needed to be resolved such as ownership transfer, rights to sell, and sale of properties under construction. These issues led to the development of Diminishing Musharaka as an alternative solution. But with Diminishing Musharaka, there are still operational and legal issues that have yet to be resolved until today. For example, the “right” contract to be used for period of construction, the application of Ijara and the extensive outlining of Wakalah roles and responsibilities. Failure to understand the issues and provide real solutions puts the Bank at risk. There are also legal infrastructures that have yet to be addressed such as land joint-ownership by the Bank (as a partner), and different practices of land offices for the registration of Bank as a partner. These are roadblocks (and credit risks) to the Banks to take the structure further. Malaysia is in danger where I foresee that one day the industry itself will became the absolute global expert in Tawarruq and Commodity Murabaha. With Bursa Suq Al Sila as the leading commodity trading platform for the country, backed by the government (as a national bourse), the Tawarruq structure is expected to evolve into an efficient Islamic-structure engine. 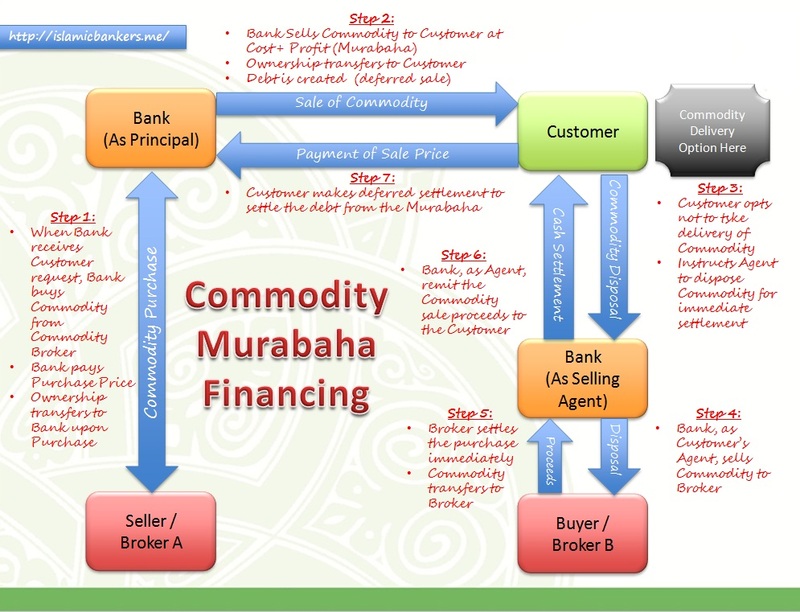 The processes of Commodity Murabaha will become seamless, and may even integrate into a Bank’s core banking system, the operation for buying and selling commodity will become commonplace and familiar, and this will result in effective processing, awareness of Shariah risks, compliance to trading requirements and well as reduction in overall operational risks. Banks will one day become so well versed in Tawarruq, they will question the need for other types of Islamic contract, where they may not able to fully comply with. capital investments will be made into perfecting the Tawarruq infrastructure, and Banks will also be able to comply with BNM requirements by investing in human capital familiar with Tawarruq. product structures will be developed around Tawarruq and once these products are established, it will be difficult to unwind as a prefered product simply due to the ease of the Tawarruq contract requirements. variations and hybrid products will be introduced based on Tawarruq, or containing elements of Tawarruq to solve “difficult scenarios” for compliance. We will one day have an innovative and world class Tawarruq product, but no development in the other major Islamic contracts. Innovation will stall and Banks will choose quick returns and operational ease of Tawarruq. It is a dilemma of the industry where it is heading to “one” major solution for almost all “sale-based products”. It is unfortunate if Banks chose to abandon the other contract alternatives, where such contracts will never reach its full operational and theoretical potential. Hoping that a Bank will take the lead to develop products based on all the various Policy Documents instead of relying on only Tawarruq and its variations. The industry needs expansion and enhancement and by focusing on only Tawarruq, the industry will not be able to explore exciting products and expand its horizon. The Policy Documents, as beautifully written as they are, may tragically one day just becomes an academic relic issued by BNM. 2016 was another interesting year for Islamic Banking. Economically, the industry followed the growth trend of the market; while still recording about 12.10% growth in the first 6 months of 2016, it is showing a slowdown in line with the overall economy. Nonetheless, there are still significant demand in Islamic Banking, and some financial institutions are also in the midst of moving from a conventional offering into Islamic Banking. Bank Pembangunan, for example, is undergoing transformation exercise into Islamic Banking. And another foreign bank just started to offer Islamic Banking products via a window in July. Small steps towards increasing the market presence for Islamic Banking. Investment Account and Investment Account Platform. Investment Account remains one of the focus products by BNM pushing for risk-sharing structures mainly the Mudharabah (profit sharing entrepreneurship) and Wakalah Bi Isthihmar (Agency for Investment). Maybank Islamic, in particular, has gone out to actively promote Islamic Investment Account, and introduced Term Investment Account, which did very well in 2016 with declared returns of around 4.0% p.a. This outlines the potential to grow this product further. Furthermore, The Investment Account Platform (IAP) which is based on Musyarakah (Partnership) structure also saw the first few listing of ventures made available to the public. A good start in 2016 and expected to see more listing in 2017. Employee Provident Fund-i and Bursa Malaysia-i. These are 2 significant additions to the industry to provide more focus on Shariah compliant investment activities. EPF-i got a lot of positive news when it was announced, and the fund commenced operations beginning 1 January 2017 when participants funds who registered are now managed under the rules of Shariah. Bursa Malaysia-i was also launched with much fanfare where it is dubbed as the “world’s first end-to-end integrated Islamic securities exchange platform” where you are able to list, trade, clear and settle Shariah compliant instruments which complies with Shariah rules. These developments hopefully will push the industry further, and personally I would like to see more being done in the Islamic Fintech sector. While I note there have been a significant number of “seminars and forums” discussing Islamic Fintech, unfortunately very little is being done in terms of Shariah discussions to support the real development needed. Hopefully those Banks that have started these initiatives to develop Islamic Fintech can introduce some of the innovations soon. I feel there is much work that is yet to be done. For readers of this website, I also want to express my appreciation for you comments, feedback and support for 2016 and hope we can continue to build progressively our understanding and knowledge of Islamic Banking in 2017. Thank you and happy reading.